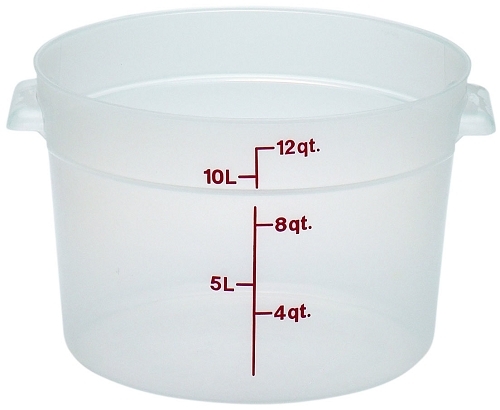 Dimensions - Top Dia 14-7/8" Height 8-3/8"
Use to store ingredients or transport ready-to-serve or partially prepared foods. Round shape promotes proper air circulation around the container. Easy to read imprinted graduations on the outside for inventory at a glance. Molded-in holes in the handles for quick and sanitary drying. Snap on covers fit tightly, yet can be easily removed. Made of translucent material that is both durable and resistant to stains. Withstands temperatures from -40°F to 160°F (-40°C - 70°C).